"They were observed struggling and rolling over in the surf." 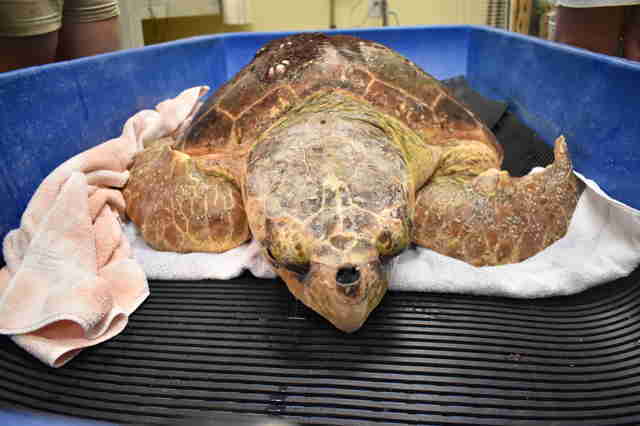 Two loggerhead sea turtles who were just admitted into a rescue center in Florida were on the brink of death before people rushed to help them. "They were rescued near the shoreline off Captiva Island. They were observed struggling and rolling over in the surf," Heather Barron, medical and research director at the Clinic for the Rehabilitation of Wildlife (CROW), told The Dodo. People from the Sanibel Captiva Conservation Foundation (SCCF) managed to approach the visibly weak, nearly comatose turtles and capture them, transporting them to CROW for emergency care. 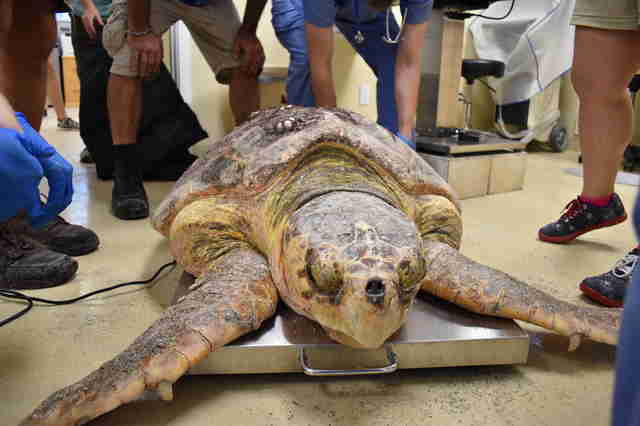 Sadly, seeing ailing sea turtles in Southwest Florida has been more common in recent months. Already, over 400 sea turtles have died since November because of a phenomenon known as the "red tide." The red tide is a particular kind of harmful algae bloom that produces a poisonous neurotoxin that can kill animals who live in the water. "It can even be harmful to humans on the beach by causing respiratory issues or can make people sick (neurotoxic shellfish poisoning) if they consume shellfish contaminated with the toxin," Barron said. "The toxin affects the nervous system and different species can exhibit different clinical signs. 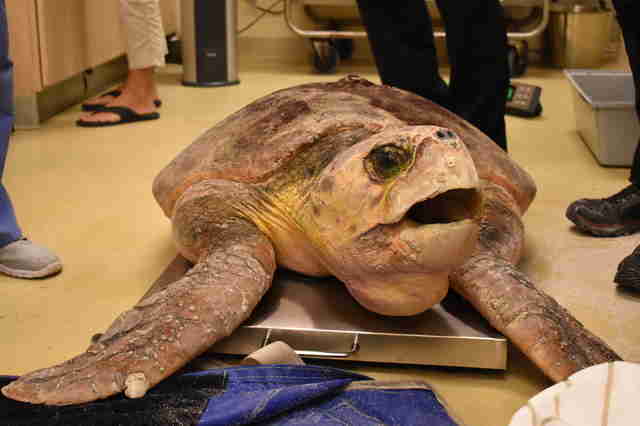 In sea turtles, clinical signs often include being very weak or lethargic, sometimes to the point the turtle is in a comatose state, and gastrointestinal issues." The red tide is naturally occurring, but it's particularly bad this year. Rescuers at CROW have seen four times as many sea turtles as they have seen in other years by this time. They have treated seabirds who get sick from the poisoning, as well. 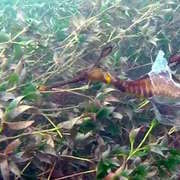 Some researchers say that worsening red tide can be linked to pollutants people put in the water, exacerbating the phenomenon and putting the lives of so many sea creatures in danger. To add to the problem, Florida has recently cut funds that would normally help with monitoring the quality of the water. 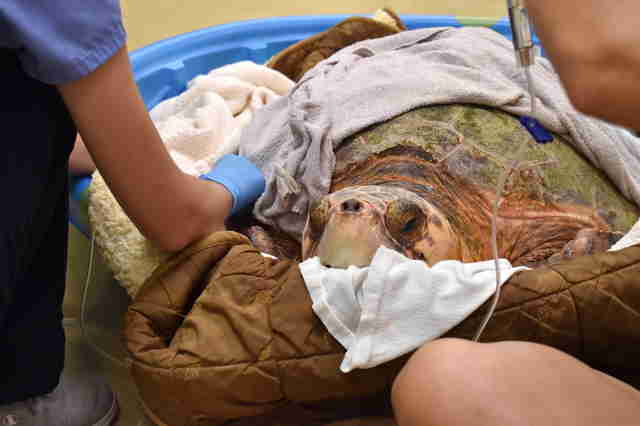 For the two loggerhead sea turtles who were admitted to CROW in late July, the first 24 hours at the rescue center were critical. People rushed to give the turtles fluids to help flush the toxins out of their bodies. Some sea turtles also suffer from pneumonia or get secondary injuries when they become too weak to swim properly. All species of sea turtles are threatened or endangered because of a multitude of factors, from getting caught in fishing nets and ingesting trash to beach erosion, pollution and climate change. Thankfully, these two turtles showed quick signs of improvement — and rescuers could breathe a sigh of relief that two lives were successfully saved. The turtles were transferred to Mote Marine Lab to continue recovery, a place that is working with CROW and the Loggerhead MarineLife Center to find solutions for sea turtles impacted by red tide poisoning so that more lives can be saved in the future. "It is the hope that, once fully rehabilitated, these turtles will be fitted with satellite tags by Mote Marine Lab and the Sea Turtle Conservancy to be able to continue studying their movements and activity once they are released," Barron said. The turtles — who are now able to swim around in tanks as they recover — already seem to have more of a spring in their stroke. To help protect endangered sea turtles, you can make a donation to CROW. You can also make a donation to the Sea Turtle Conservancy.